A decade ago, clouds over West Africa started clumping together — innocently enough. Who would have known that the hurricane resulting from these humble beginnings would become the most expensive natural disaster in American history? 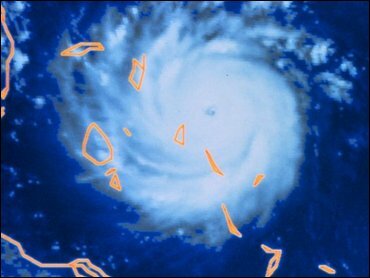 In 1992, Hurricane Andrew blew on to the Florida coast. Two days later, it unleashed its wrath on Louisiana. The downpour of sheets of rain and wind cost roughly $26 billion in damages. Some 126,000 homes were destroyed, 80 percent of the area's farms were wiped out and more than 65 people lost their lives. Andrew was initially categorized as a class 4 hurricane but today scientists have declared it a category 5; only the third such hurricane to have such a high category in U.S. history. A category 4 has winds of up to 155 mph. A category 5 has winds of 156 mph and higher. The stronger the winds, the greater the damage. A category 5 is like a monster tornado. On Wednesday, scientists officially agreed that the storm did have winds that hit 165 mph and categorized it as a 5 storm. Norcross explains that better information can now more accurately measure hurricanes strength. A new instrument called a GPS Dropwindsonde is a package dropped from an airplane into the hurricane. This new device detects the winds more accurately and can be dropped at any place to find the strongest winds. But, he admits, there was little that could have been done in the time the hurricane built up strength. “We have better information on how strong they are but, when it comes down to it, where you live … if you live on the coast and you have to have a strong house. More people are at risk because they are in condos on the coast and more people need to move inland,” said Norcross. © 2002 CBS. All rights reserved.